Quarterly meetings are held four times a year. Various subject sessions and groups meet together at roundtables. Attendees share ideas, discuss concerns and offer solutions. The Roundtable will vary from meeting to meeting. Participants should bring ideas to share, including photocopies of handouts. Be prepared to present concerns and solutions from your program with the group. 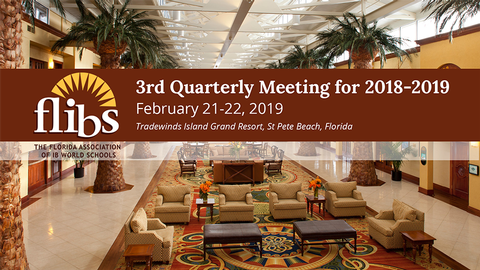 All sessions are held at the Tradewinds Island Grand Resort. To make a reservation now at The Tradewinds, click https://www.tradewindsresort.com/flibs19 or call Group Reservations at 800-808-9833. FLIBS has partnered with VIP Travel & Tours to assist with air & ground transportation packages for our meeting attendees. You may contact our representative, Ms. Ellen Lyons, to assist you in finding the best rates on round-trip airfare to Tampa International and ground transportation to the hotel. You may reach VIP at 800-441-8114 or email viptravel@centurylink.net. *These meetings are usually attended by members of these groups only, although all FLIBS meetings are open to the membership. Payments are accepted through the on-line payment system in the form of all major credit cards and ACH check payments. We also accept purchase orders, wire transfers, money orders and checks by mail to: Florida League of IB Schools, P.O. Box 551, Williston, Florida 32696 (USA).